“Margaret”, 1st Open INFC Friendship Nat, Lamballe. Bred and raced by N. Black & Son, Dromara. The final race from France was the Friendship National which was flown from Lamballe due to difficulties with the authorities at the release site in Brest. 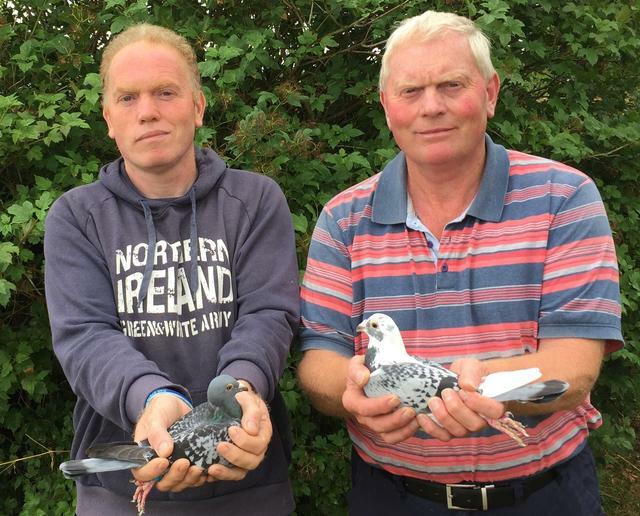 900 birds were race marked in Lisburn last Tuesday and liberation was on Friday 13th July at 6.30am in a Lt Easterly wind. Some 16 birds were timed on the winning day and that number got up to 100 on the second day with helping conditions, it turned out the best of the season’s races from France. The only bird recorded into the Muckamore Station on the day was timed by Arnold Thompson a dedicated long distance loft from Ballyclare. Twice winner of the event Alan Darragh timed at 10.30am on the second morning into Cullybackey and had a second bird later in the day, Tom Young the Chairman in Ahoghill has had a great old bird season and timed on the second morning for 1st in Mid Antrim Combine. W & L McCaw from Ballymoney won the event from Sartilly in 1993 and will be pleased with three arrivals on the second day. The overall winner was N Black & Son of Dromara, former Kings Cup winners and twice National Champions, it was another Champion performance. Timed at 6.45pm flying 437 miles the Black Family win the Friendship Cup. Race was sponsored by H Beattie & Son. 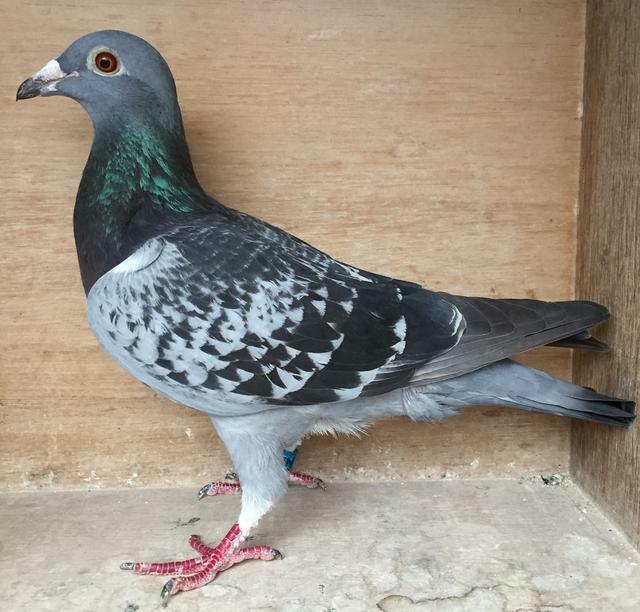 John Greenaway from Bondhill wins the Triple Award Diploma for 3 times in the result with same bird: 2016 – 38th Open INFC Quimper, 2017 – 2nd Open INFC Lamballe, 2018 – 83rd Open INFC Lamballe. Claims for any Merit Awards, or Triple Diploma awards in writing please to Secretary Trevor Topping. The Top 10 report will follow, send details to Homer and photo if possible. INFC Friendship Nat Lamballe 213/900 – N Black & Son Dromara 1046, J Hand Skerries 1013, G O’Reilly Malahide & Dist 1009, H Silcock Dromara 1007, Mark Maguire & Son Millvale 1005, N Grant & Sons Balbriggan 972, T McClean Annaghmore 961, Smyth Family Loft Kircubbin 960, Smyth Family Loft 960, J Hand 953, A Thompson Ballyclare 944, P Rock & Son Skerries 929, F & J Crowe Gorey RPS 821, J Cullen Bray Inv 788, W & L McCaw Ballymoney 779, P Dunlop Edgarstown 758, P McFadden Monaghan 758, P Dunlop 749, F & J Crowe 738, F Moran Malahide & Dist 729, W G Neill Annaghmore 707, P Cairns Gilford 707, J Serplus Laurelvale 699, Pritchard Bros Annsborough 687, Donnelly Bros Millvale 675, C & H Beattie Gilford 673, W G Neill 673, W G Neill 673, P Cairns 670, J Dowey Laurelvale 669, W & L McCaw 656, C McManus Corrigs 645, Dowey Bros Laurelvale 640, G & C Topley 638, R Duddy Ballyclare 638, N Black & Son 637, R Duddy 637, A Darragh Cullybackey 637, R Williamson Bondhill 632, Balmer T Young & Son Ahoghill 624, N Black & Son 624, A Thompson 619, E Murtagh & Son Ind North 613, M Hughes Edgarstown 609, J Greenaway Bondhill 609, N Black & Son 605, F Simpson Doagh & Dist 604, S & W English Lisburn & Dist 602, Fulton & Dickson Ards 597, B McAvoy Drumnavaddy 593, G & C Topley 590, W Corrigan Loughgall 589, G Buckley & Sons Annaghmore 586, P Dunlop 584, Colman O’Hare & Son Newry & Dist 580, J & R Young Portavogie 576, N Black & Son 573, J Cleland Annsborough 573, H Gormley & Son Monaghan 570, G & P O’Dowd Ballybrack 567, R & A Gore Lagan Valley 560, P Swindell Newry City 554, M Robinson Bondhill 550, W & L McCaw 549, M Robinson 547, S O’Hara Monasterevin 547, R Williamson Bondhill 545, B & H Marshall Newtownbreda 540, P Rock & Son 538, Mal Maguire & Son Millvale 535, P Campbell & Sons Armagh 532, P & J Jones Skerries 528, P McFadden 518, A McAteer & Sons Ballyholland 515, Donnelly Bros Millvale 514, Donnelly Bros 508, Kenna & Finn Arklow United 508, G Swift Monaghan 507, Donnelly Bros 503, Lyons & Kennedy Hills & Maze 492, J Waring & Son Lisburn & Dist 484, A Darragh 480, J Greenaway Bondhill 477, T McClean 474, M Lavery Trim RPC 471, Gregory Bros Rathnew 465, G & C Topley 461, J Doheny Malahide & Dist 458, S McAllister & Sons Lagan Valley 457, C & G Quinn Drumnavaddy 447, D Coulter Glenavy & Dist 445, R Duddy 443, J Murtagh & Son Ballyholland 433, J Downey 433, C McManus 431, K O’Brien & Son Malahide & Dist 415, P Swindell 415, N Grant & Sons 397, P Rock & Son 393, S O’Hara Monasterevin RPC 392. Muckamore Station Lamballe – Arnold Thompson Ballyclare 944, W & L McCaw Ballymoney 779, W & L McCaw Ballymoney 656, Robin Duddy Ballyclare 638, Robin Duddy Ballyclare 637, Alan Darragh Cullybackey 637, Balmer Tom Young & Son Ahoghill 624, Arnold Thompson Ballyclare 619, Fred Simpson Doagh & Dist 604, W & L McCaw Ballymoney 549, Alan Darragh Cullybackey 480, Robin Duddy Ballyclare 443.